No Cinderella has emerged at the ball as the first round of the States and Territories Flag Tournament is now in the history books. In the North Divison, especially heavy in seal-on-blue flags, any kind of distinctiveness tended to win the day. 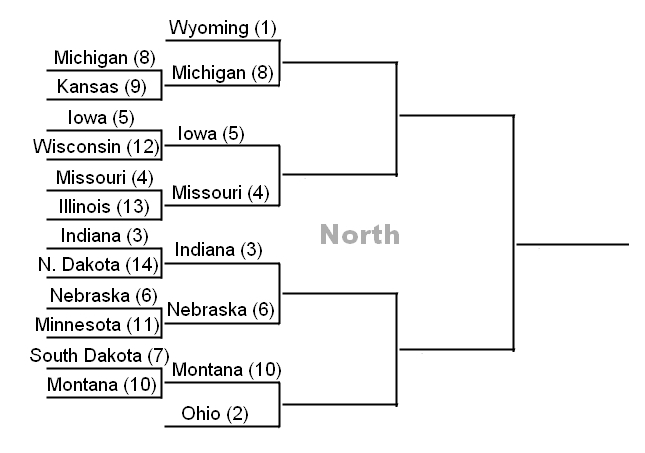 Third-seed Indiana led the charge, crushing hapless North Dakota by a score of 36-3, while fifth-seed Iowa made similarly short work of Wisconsin, 25-3. Putting a seal on a white background helped a little, but not much; Missouri steamrollered the Illinois eagle 19-9 with the help of a vocal pro-bear contingent. The closest thing to an upset in the North was delivered by tenth-seed Montana, which delivered a stinging 22-6 victory over South Dakota. The flag of the seventh-seed "Mount Rushmore State" was widely panned for what voters saw as an inappropriately promotional slogan incorporated in its design. 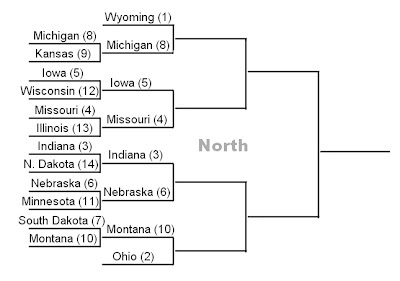 Montana will go on to face the controversially shaped number two seed, Ohio, in the second round. Elsewhere in the North, sixth-seed Nebraska easily defeated Minnesota 18-8, and eighth-seed Michigan breezed by Kansas 18-9 on the strength of its rampant ungulates. Michigan's deer are expected to struggle next week, however, against the buffalo of first-seeded regional powerhouse Wyoming. The West Division is home to many flags considered among the strongest in the tournament, so lopsided scores run up by the favorites were not unexpected in the first round of this bracket. 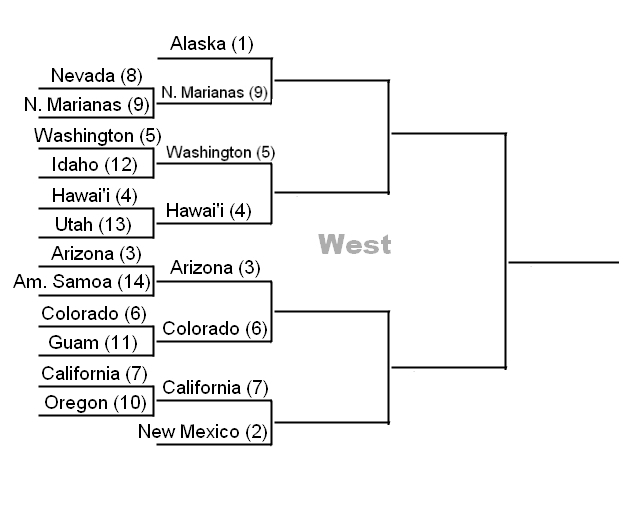 The ninth-seed Northern Marianas managed to surprise eigth-seed Nevada 16-10, however, winning what is expected to be a merely honorary chance to take on much-feared Alaska, the West's top seed, in the second round. Neither third-seed Arizona nor fourth-seed Hawaii faced serious competition in their openers, with the Copper State blasting American Samoa 27-4 and the Aloha State pasting Utah 26-3. American Samoa's sense of defeat was likely tempered, however, with multiple complaints that it had been been put at an unreasonable disadvantage with its uneviable 14th seed. 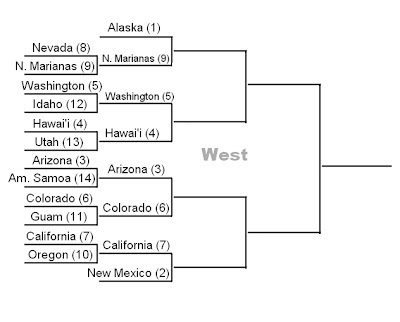 Also in the West, the green field of Washington's flag helped pull the fifth-seed Evergreen State over Idaho, 19-6; sixth-seed Colorado took care of business over Guam, 18-10; and seventh-seed California decisively trounced the uniquely two-faced Oregon banner, 21-6. California, another state helped by pro-bear sentiment, will hope to retain that momentum when it takes on legendary second-seed New Mexico in next week's showdown.